I needed some craft supplies as I wanted to try out making my own magnets, necklaces etc just as a little project for myself. 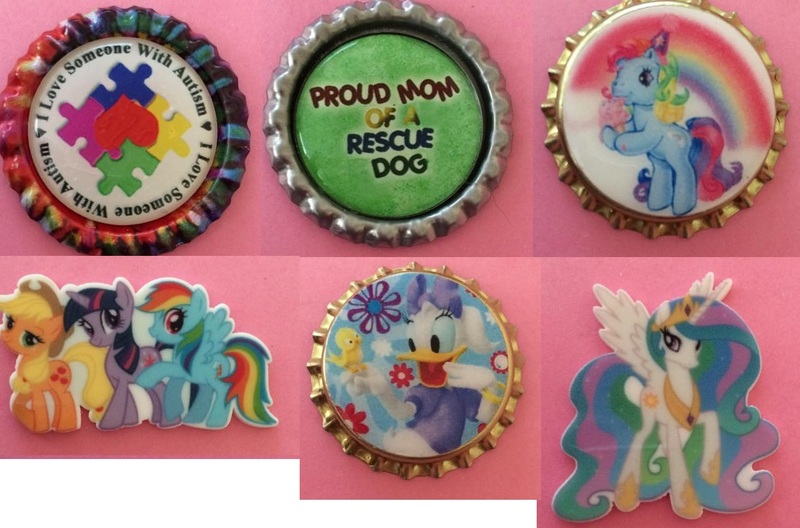 Sammie's Craft Supplies sells lots of My Little Pony and Disney ones so it caught my eye and her prices are amazing. Here are my little embellishments. I think that I will turn most of them into little magnets. I got four bottle-cap style ones which are very cute. The one on the top left is very close to my heart as I work with Autistic young people in my full-time job. I don't talk much about my job on here but, yes, this is a nice little embellishment. The doggy one is also cute, we actually have cats in my house but almost all of them are from rescue homes. I feel quite strongly about rehoming animals as do lots of people so I can see how this magnet could appeal to lots of people! As for the others, their cuteness is self-explanatory. I love ponies, they are amazing and gorgeous and Daisy Duck is super precious. Definitely check out Sammie's Craft Supplies for lots of cute, reasonably priced embellishments. She sells a large variety of different ones so it's worth having a look.